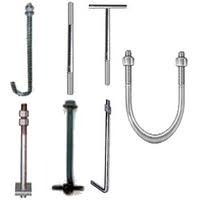 Manufacturer of a wide range of products which include stainless steel fasteners, industrial fasteners, metal fasteners, corroshield construction fasteners, fasteners and corroshield fasteners. 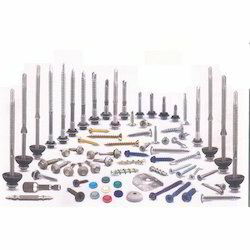 We are importer, traders and suppliers of Stainless Steel Fasteners, Industrial Fasteners, self tapping screw, roofing screw, corroshield self drilling screw, color coated roofing screw, high corrosion resistant self drilling fasteners. A fastener is a hardware device that mechanically joins affixes two or more objects together. Fasteners can also be used to close a container such as a bag, a box, an envelope; or they may involve keeping together the sides of an opening of flexible material, attaching a lid to a container, etc. There are also special-purpose closing devices, e.g. a bread clip. Fasteners used in these manners are often temporary, in that they may be fastened and unfastened repeatedly. Some types of woodworking joints make use of separate internal reinforcements, such as dowels or biscuits, which in a sense can be considered fasteners within the scope of the joint system, although on their own they are not general purpose fasteners.Furniture supplied in flat-pack form often uses cam dowels locked by cam locks, also know as conformat fasteners Items like a rope, string, wire (e.g. metal wire, possibly coated with plastic, or multiple parallel wires kept together by a plastic strip coating), cable, chain, or plastic wrap may be used to mechanically join objects; but are not generally categorized as fasteners because they have additional common uses. Likewise, hinges and springs may join objects together, but are ordinarily not considered fasteners because their primary purpose is to allow articulation rather than rigid affixment. Other alternative methods of joining material include: crimping, welding, soldering, brazing, taping,gluing, cementing, or the use of other adhesives. 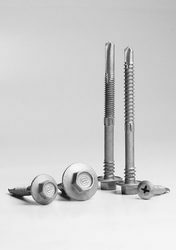 The use of force may also be used, such as with magnets, vacuum (like suction cups), or even friction.There are three major steel fasteners used in industries: stainless steel, carbon steel, and alloy steel. The major grade used in stainless steel fasteners: 200 series, 300 series, and 400 series. We are Importer, Traders and suppliers Industrial Fasteners. Our Brand is Corroshield Corrosion Construction Fasteners, We are Leading Supplier of Corroshield Industrial Fasteners in Coimbatore,Tamil Nadu, Kerala, Karnataka and as well as Full Of South India. We are the Largest Supplier of MetalFasteners in India, South India,Tamil Nadu at Coimbatore, Madurai, Salem, Erode, Tirupur, Kanya kumari, Tirunelveli, Dharmapuri, Tuticorin, Nagercoil,Trichy, Dharmapuri, Pudukottai,Krishnagiri, Hosur,Thanjavur, pattukottai,aranthangi, aruppukottai, rajapalayam, sivakasi, koilpattai, tenkasi, viruthunagar, dindugal,mettur, sathur, and all over Tamilnadu. Steel world are authorized distributors of all corroshield products & corroshield construction fasteners for Tamilnadu other than Chennai. Apart from distribution, we also provide free consultancy on proper and correct size of screws for different application like roofing, cladding, false ceiling and wall partition. 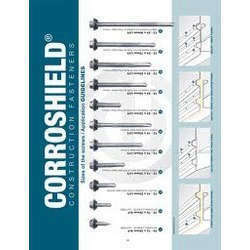 Corroshield the name itself implies it is a fastening systems that is shielded from corrosion problems. The corroshield fasteners are coated with our in-house proprietary coating. the coating technology was initially imported from Australia and further innovated by our application. basic compound of corroshield coating of tin-zinc and is mechanically deposited. In the last 3 years we have supplied corroshield screws to more than 5000 projects covering a total are of 83 million sq. Mts. Corroshield fasteners are coated with our manufacturing as per Australian standard of mechanically deposited/plated tin-zinc. We are the Largest Supplier of Foundation Bolts in India, South India,Tamil Nadu at Coimbatore, Madurai, Salem, Erode, Tirupur, Kanya kumari, Tirunelveli, Dharmapuri, Tuticorin, Nagercoil,Trichy, Dharmapuri, Pudukottai,Krishnagiri, Hosur,Thanjavur, pattukottai,aranthangi, aruppukottai, rajapalayam, sivakasi, koilpattai, tenkasi, viruthunagar, dindugal,mettur, sathur, and all over tamilnadu.